chris chandler : Newsletters : Today is 8-8-8! Sorry to bother you but as I have every year since January second of 2002, I must write to you this year on 8-8-8 to celebrate the number 8. As a kid I knew that I would live through these dates. I thought about it back on July 4, 1976- that I would live through dates like 8-8-88 and even 01-02-03. So I HAVE TO acknowledge this mile stone. The passing of 08-08-08 is particularly important because as a kid I knew why 6 was afraid of 7. Well because seven ate nine. SOOOOO. This year's missive is brought to you by the number 8. As for me, I learned to count from Sesame Street only it was confusing because the count in Sesame street only had four fingers. I thought he should be counting in base 8. Most cartoon characters have 8 fingers. This has left me confused I learned to count in base 11 because I had my hands in my pockets. In the end there are ten types of people in this world. It is two cubed how bout that? It is the atomic number of Oxygen. Ooops, I could have had a V-8. hows that for an advertising slogan? I have an idea lets make a health drink and name it after a muscle car engine. "That thing got a hemi?" The number 8 sideways is the symbol if infinity. Perhaps because the number 8 represents what is beyond time for there are 7 days in a week. I always thought that was funny when I played 8-ball. 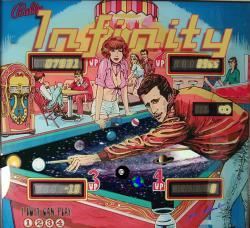 Depending on how the ball is sitting you say "infinity in the corner pocket." The poor shall have lodging in the kingdom of heaven. Those persecuted for seeking righteousness shall inherit the kingdom of heaven. The merciful will themselves obtain mercy. The peacemakers will be known as the children of God. Perhaps this is why the Olympics are starting in Bejing on 8-8-8. Only thats the date on OUR calendar so much for that theory. So maybe it has to do with the fact that they had a bloody civil war in around 300 AD known as the War of Eight Princes. There are 88 keys on a piano. There are 8 strings on a mandolin. And a Bazooki, and A Quatro, and ummmm. A twelve string guitar with four broken strings. A stop sign has 8 sides well 10 if you count the front and back. "Section 8" refers to crazy and I have always loved the game crazy 8s. "Oct" ober is the 10th month which never made any since to me but I think it had to do with the vanity of some Roman Cesar or another I bet it wasn't "OCT" avia.